Home / Dance / What is an Academy of Dance OR a Competition Studio? One of the most often-asked questions from parents about dance is the difference between an Artistic, or Academy style school and a competition-based studio. They both have a distinct approach to teaching dance and other performing arts, and they have unique perspectives on the artistic quality and values of dance. 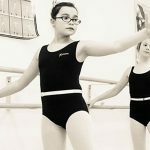 Competition studios focus on teaching routines, with limited time, if any, spent on technique classes. The technique is taught inherently within the routines using a ‘watch me, do this’ or ‘I do it, you do it’ approach. Classes tend to have a large number, often 20-25 in class, and the focus is in creating energetic, eye-catching, sometimes trick-filled choreography that the audience and judges love. The studio atmosphere is filled with energy, a competitive mentality between the dancers and levels, and can produce good dancers who assimilate well into the east and west coast competitive cultures. Dance wear worn in class is often very stylish, and a bit skimpy, and choreography can have elements that some might consider inappropriate for particular age groups. By contrast, the artistic studios take a more holistic approach. They encompass privately owned academies and studios, and company schools that are tied to a professional performance company in ballet, contemporary, jazz or other dance form. Class sizes are generally smaller, except in company schools, and often use a written curricula and more distinct levels of ability. Dance wear is modest and, in the case of ballet, may be limited to leotard, tights, shoes, and hair in a bun, to mirror the more strict regimen of ballet. Students from these schools generally excel in school and do well when attending dance intensives and university workshops. Just as it has been recognized that students in sports are team players, tend to maintain higher GPAs, and have a higher graduation rate, the same is true for involved dancers. Parents and students will need to decide which style suits their culture, ethics, and desired outcomes. Often, choices are made on a parent’s personal experience. If they grew up in a competition based studio, they will tend toward them. Likewise with an artistic school parental experience. If a family is looking for a program that will encourage self-motivation, evaluates progress on a regular basis, expands the student experience to include dance terminology, French terms when ballet is taught, age-appropriate anatomy and movement principles, critical thinking skills and creativity, and high-level dance experiences, they will tend toward an artistic or academy style school. Regardless of which type of training you choose, the arts are a gift to your child, or yourself, that will keep on giving throughout life. This was a wonderfuly written and helpful article. I had figured most of it out but it was good to be validated. I have one granddaughter in each kind of studio!